It‘s a true story that’s more intriguing than most fiction… and a story where the predominant themes are identity, acceptance, and ultimately, survival: A little girl grows up feeling “different“. She feels sexually attracted to other girls. She comes out as a lesbian to herself as well as to her family and friends, and ultimately finds acceptance. She also eventually finds true love. Later on, however, a restlessness motivated in part by the death of her soulmate causes her to believe that she may NOT be a lesbian, but rather may be a man trapped in a woman’s body. 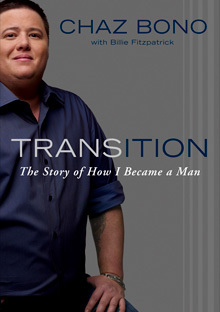 That is the stripped-down version of 41-year old Chaz Bono‘s “Transition: The Story of How I Became a Man“— without giving Bono the credit as an accomplished musician, writer, and activist which he earned through the years as Chastity and then later as a man reborn as Chaz. Bono‘s third book is written in a very basic, almost laid-back style. It‘s without melodrama or overly indulgent language, even as he is describing some VERY personal details about his life, body and soul– as well as the merciless schism that often arose between the two. With what Bono has to tell us (including issues of childhood abuse, addiction, cancer, the cruelty of the media, and depression alongside the predominant theme of gender identity disorder ), elaborations are not really needed. His childhood was imprinted with a feeling of being “different” as early as he can remember, with a marked difference between how his father Sonny and his mother Cher reacted to young Chastity‘s tomboy tendencies. While his father accepted his desire to dress and act like a boy, his glamorous mom did not. In an early anecdote in the book, Chaz recalls, “At the beginning of the second grade, my mother bought me a jean skirt with Wonder Woman patches on it. She demanded that I wear it to school. Now, I love superheroes– but my favorite was the Hulk, certainly not Wonder Woman. I think she actually was trying to institute a wear-a-dress-or-skirt-once-a-week to-school rule at the time, so she made me wear the skirt… As I walked down the hall of my elementary school, my friend Jake saw me and quickly came up to me. ’What are you wearing?’ he asked. He was looking at me like I had two heads. ’Why are you dressed as a girl today?’… I was beyond mortified.” Chaz notes that after that emblematic incident, he never wore a skirt or dress again, and his mother never insisted he do so. Victory! In “Transition”, we learn about Chaz’ Bono’s life as Chastity in between his “two puberties“: a life that included coming out as a lesbian in a big way, and taking a stab at being a rock star in her own right. While Chastity was less than satisfied with her experience in the music industry (Hit single in Flint, Michigan notwithstanding, only the most ardent analysts of pop culture will remember her band Ceremony. ), she found more success and satisfaction with writing and GLBT activism… which continues to this day now that Chastity is Chaz. There’s quite a difference between Bono’s “first puberty” at age 11 (a rather traumatic, unwelcome experience) and his “second puberty“, which was spearheaded by male hormone therapy 29 years later and was more joyous. Bono describes it as “an odd, but exhilarating, time. Through his own story, the reader learns a great deal about the experiences of FTM’s (female to male transsexuals). Chaz’ observations echo what many of his predecessors have stated: that they first identified as lesbians before realizing that they were really men born in women‘s bodies; that the “top surgery“ to remove the breasts was a major step in their happiness and identity, and– perhaps most worthy of exploration– how they receive more respect in our society as males than they do as females. That‘s a phenomenon which speaks volumes about the treatment of women in our society, even after years of so-called “enlightenment”. The education in sexual politics is not without its lighthearted moments: Some readers might find it amusing when Chaz learns that (1) straight guys generally don’t hug each other “hello“, and (2) unlike in the ladies’ room, men don’t socialize with each other in public restrooms. Chaz’ story may be familiar at least in part to many of his fellow FTM’s… but what is exceedingly uncommon about Bono‘s story, of course, is that Chaz was born in the glaring eye of celebrity, courtesy of some very famous parents. “For better or for worse, my parents’ decision to put me on their television show has shaped the course of my entire life. But even I can’t believe that the cherubic little girl from the television screen would grow up to be a middle-aged man.” Chaz writes. Clearly, he did not have the luxury of disappearing into a nice quiet life that the “transman next door” may have had. This is why I go nuts when some pinheads claim that Chaz Bono is only looking for publicity with his decision to tell the world about his transition. When someone is seen by millions of people on TV beginning with childhood, does that person really even have a choice but to be out in the public eye anyway? Why not own your own story? As Mr. Bono learned, it can be very empowering. Previous BULK The Series: This September, Love Is Rough!